In a skillet, melt butter over medium to medium high heat; cook onion, chili and garlic. Add the diced chorizo and stir. Stir in potatoes and achiote. Cook for a while; add Worcestershire or soy sauce, cumin, salt and pepper. Turn off the heat and add the hard-boiled eggs. Set aside. Using a rolling pin, roll out the puff pastry to stretch it out a bit. Cut pastry into squares, place approximately two tablespoons of filling; glaze the edges with beaten egg. 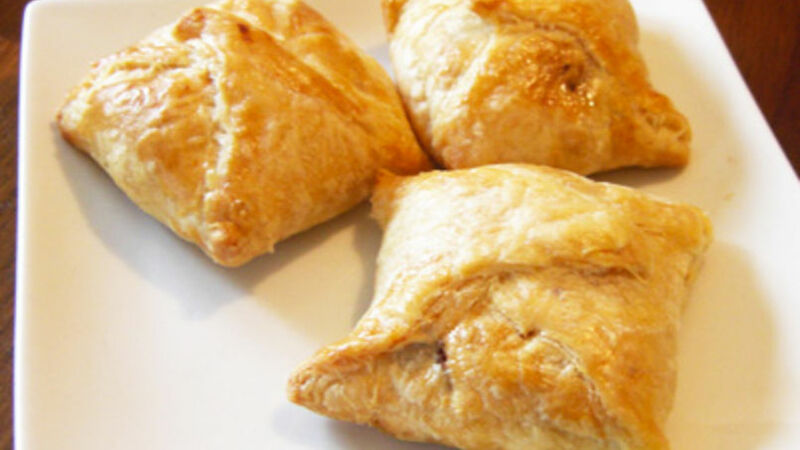 Close pastry by pressing edges of squares together in the center and glaze with beaten egg. Place on a baking dish, in the oven for 40 minutes or until golden brown. The chorizo may be replaced with shrimp or any other meat. It’s a matter of creativity. For some people, an enchilada is about corn tortillas and stew. But in Costa Rica it’s a different story. It’s a delicious, soft, crunchy puff pastry – a true paradise of flavor, texture and aroma. Just try it and I guarantee you won’t be able to resist it. I’m not exaggerating.